Entry #57: Mile 239, Rye, New York. Everyone Goes to Mrs. Haviland's. Rye, New York is a pleasant town in Westchester County, 31 miles from Federal Hall in Manhattan via the Old Boston Post Road. In the eighteenth century, Rye was a popular place to stop for the evening either traveling to or from New York, as 30 miles was a typical distance that a horse and rider could cover in one day. President George Washington commenced his journey through New England on Thursday, October 15, 1789 and stopped for the night at Mrs. Haviland’s Inn in Rye, as noted above. Stopping the next day in Stamford, he says of Webb’s tavern that it is “a tolerable good house, but not equal in appearance or reality to Mrs. Haviland’s.” (1) High praise indeed from the taciturn First President. Incidentally, Vice President John Adams also mentions stopping at Mrs. Haviland’s in his diary; thus Mrs. Haviland could make the claim that the first two presidents of the United States stayed at her inn. Sadly, the inn came into existence after Sarah Knight made her way through the area in 1703, as I noted in the previous entry; it would be amusing to read what she would have made of the inn. Neither of the other travelers who have contributed so richly to my understanding and appreciation of the old post road, Alexander Hamilton and James Birket, mention Rye in their journals, although both traveled through the area before Mrs. Haviland became the proprietor of the inn in Rye. Mrs. Haviland is, however, mentioned in the account of the travels of the Frenchman Brissot de Warville. He traveled through the area two years after Washington and notes that he traveled 33 miles from Fairfield to Rye, where he stayed at what he considered the best inn he had seen in America, that of Mrs. Haviland, and “had an excellent dinner, and cheap.”(2) Another early traveler, Reverend Manasseh Cutler, stopped for breakfast at Mrs. Haviland’s on his way to New York in July, 1787 and provides us with a vivid description of both Mrs. Haviland and her tavern. Cutler says of the tavern, “This house has more of the air of a gentleman’s country seat than a tavern. It is a large, well-built house, with a piazza extending the whole length of the front, well-finished and elegantly furnished...a spacious garden, laid out in a beautiful form.”(3) His comments about Mrs. Haviland are even more effusive as discussed below. Thus we have a number of glowing accounts of Mrs. Haviland’s tavern by some rather illustrious travelers, which arouses my curiosity about the proprietor and prompts me to dig a bit deeper. Not since Case’s tavern in South Kingstown, Rhode Island have I read such effusive praise for a specific tavern, and the rave reviews for Mrs. Haviland’s tavern even surpass those for Case’s. Mrs. Haviland is sometimes referred to as the Widow Haviland. Her husband Ebeneezer Haviland, a doctor who became a surgeon in the Continental Army, died at the conclusion of the Revolutionary War, on June 28, 1781. Thus at the age of 44, widowed after 16 years of marriage, Tamar Haviland returned to Rye from her wartime refuge at Wallingford, Connecticut and took up the life she had begun as early as 1770, running the inn at Rye. 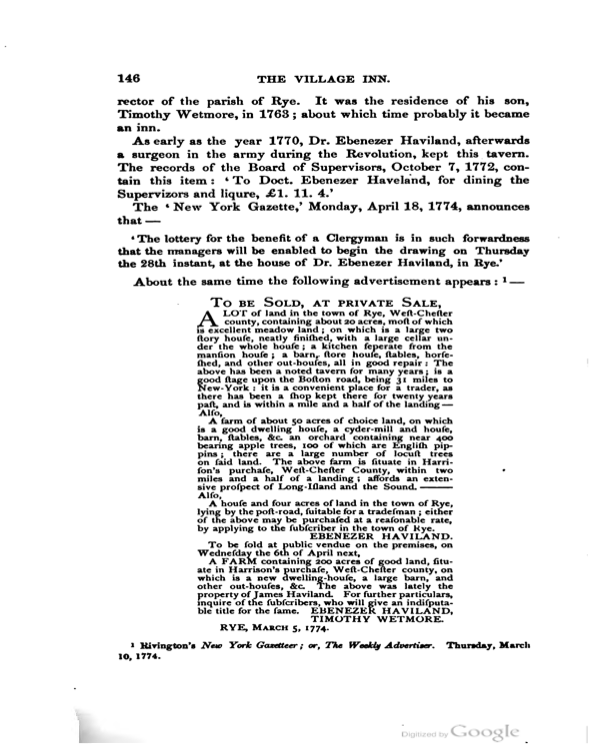 It appears from an advertisement in the New York Gazeteer (see below; reproduced from Charles Baird’s History of Rye, page 146) that the Havilands had attempted to sell the tavern in 1774, but this must have come to nought as Mrs. Haviland certainly was running the tavern in the 1780s. It is clear from the comments of her guests, that Tamar Haviland and her daughter were the most important reasons for the popularity of the tavern in Rye. The Reverend Cutler says of Mrs. Haviland and her daughter, “The owner is still more extraordinary. She is a widow of fifty, in a rich, gay dress, and affecting the airs of a young girl of sixteen. She has an only daughter, equally tasty in dress, who is, at least, approaching the old-maid’s row, but is really handsome...mother and daughter were very chatty, and we spent an hour very agreeably.” Brissot de Warville similarly was charmed by the mother and daughter Haviland: “To other circumstances very agreeable, which gave us good cheer at this house, the air of the mistress was infinitely graceful and obliging; and she had a charming daughter, genteel and well-educated, who played very well the fortepiano.” As I read these accounts (and others; a young Englishman, Robert Hunter, Jr., traveling in 1785 through Rye, was particularly smitten by the daughter) I can’t help wishing the tavern still existed to experience the pleasure of the company of the charming Mrs. Haviland and her daughter. Alas, Mrs. Haviland stopped running the tavern in 1797, when it was taken over by Peter Quintard (clearly an early Howard Johnson, as this is the fourth tavern along the route to be associated with the Quintard family). Later it fell into the hands of Nathaniel Penfield and son, who ran it until about 1830, when it ceased to be a tavern. The building still exists today, near the Rye Free Reading Room and the Boston Post Road, on the village green in the center of Rye, and is now the Square House Museum, operated by the Rye Historical Society. It is indeed a lovely building, majestically presiding over this important corner in the center of Rye, but it is only through the revealing descriptions of the proprietor of the tavern that one can truly discover a sense of what it might have been like to travel through Rye in the 1780s and 1790s. If only my experience in Rye was as pleasant as that of the guests who stayed at Mrs. Haviland’s inn. Not that I had a terrible time in Rye; I enjoyed the town very much. It is just that what at first blush appears to be a quaint town with a pretty commercial center on Purchase Street, near the Square House Museum, on closer inspection seems to be overrun with chain stores. I was singularly disappointed on the morning after my stay in a chain hotel near Interstate 95 (as there were no bed and breakfast inns in Rye) after walking the mile or so into town in quest of a small local cafe in which to have a coffee and a locally made pastry, to be forced to pull out my Starbucks card and make do with a tall Cafe Latte and the standard uninspired lemon poppyseed muffin Starbucks tries to pass off as one of its high quality baked goods. I was briefly fooled into thinking that another nearby cafe, Le Pain Quotidien, was a local bakery, but after ten seconds inside the place my spider sense warned me out of it, sensibly as it turns out to be a Belgian outfit. Nothing against the Belgians, but when I am in the quaint commercial district of a small well-to-do town in suburban America, I expect to find an aspiring young pastry chef named Jessica or Joe, freshly graduated from Johnson and Wales, churning out croissants and pecan rolls to the well-heeled regulars coming from yoga class or on their way to Wall Street, not some foreign chain restaurant masquerading as a small bakery. My little neighborhood in Boston has TWO local bakeries producing high quality goods, and we have far fewer chic-looking yuppies than I saw in Rye. I hope this is not a sign of things to come, but I fear that the creeping intrusion of chains into Main Street in even the wealthiest towns is here to stay. Where are the Mrs. Haviland’s of today? 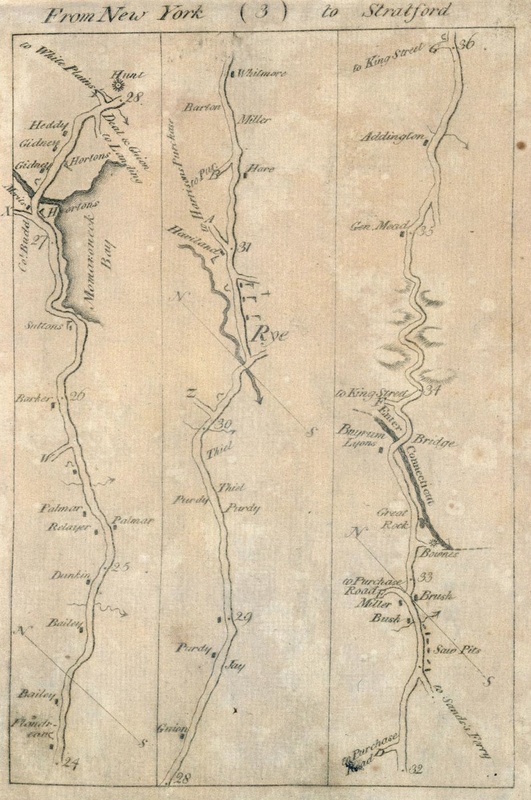 Christopher Colles’s Map of the King’s Highway from New York to Stratford, Connecticut, Section four with three sequential strip maps representing the distance from Mile 24 (New Rochelle) to Mile 36 (Horseneck, now Greenwich, Connecticut). Rye is at Mile 31, while Mamaroneck is at Mile 27. Mrs. Haviland’s Tavern is opposite the Mile 31 marker at the junction of what is today Purchase Street and Boston Post Road in Rye. The Jay estate is near mile 39 and the Village of Mamaroneck is at mile 27. According to Colles’s map as well as the descriptions of Brissot de Warville and George Washington (who cannot tell a lie) and the advertisement for the sale of the tavern in 1774, Rye was 31 miles from the southern tip of Manhattan Island by way of the Old Post Road, or the Boston Road as it is often referred to here in New York. Rye was also 32 miles from Fairfield, the capital of Fairfield County, which the townspeople so desperately wished to remain a part of in 1700. As Charles Baird puts it “ the sympathies and interests of the people then turned eastward not as now to New York.”(4) Strictly speaking, it is much closer to New York than to the center of Connecticut, but the townspeople were mostly made up of Puritans from Connecticut, and the less rigid religious laws of New York (along with a sense of feeling slighted as I noted in the previous entry) did not endear the state to the citizenry of this border town. However Rye became and remains a part of New York and is firmly in the New York metropolitan area. Rye is in Westchester County, which is part of the largest Metropolitan Statistical Area (MSA) in the United States, the New York MSA, which comprises the Five Boroughs of New York (New York County, or Manhattan, Queens, Bronx, King’s County, or Brooklyn, and Richmond County, or Staten Island), as well as Westchester and a dozen or so other counties in New Jersey and New York that are within the New York “sphere of influence.” The New York metropolitan area is so large that demographers often break it up into smaller divisions to distinguish a set of “inner” and “outer” areas. The inner core of New York, in addition to the five boroughs, includes Westchester County and three counties in New Jersey directly across the Hudson River. This area contains over 11 million people in a mere 1200 square miles, an astounding density of more than 9,000 people per square mile. Every resident of the United States could be placed comfortably in the state of New York if the United States was equally densely populated, with an entire state of Massachusetts left over as untamed wilderness! It seems hard to believe these statistics as I wander down the old road through Rye on my way to Mamaroneck. There is plenty of open space and even a couple of farms along the way. Houses are relatively far apart from each other and many of them are very large. Westchester County is a relatively small county at 433 square miles, but there are almost a million residents, and yet here in Rye it seems pretty bucolic. As I take my leave of the commercial center of Purchase Street and pass the former tavern of Mrs. Haviland, I continue my walk to New York. The restructuring of the road to New York in the early 1800s (more about this later) shortened the distance by some five miles, a fact that is recorded in the milestones to be found along the road here in Rye. A short distance beyond the Square House Museum, opposite Rectory Street, is supposed to be a milestone indicating 26 miles to New York. Unfortunately, the snow is piled so high that even if there were a stone there I am unable to locate it, even after digging away the snow with my hands at a couple of promising places along the road, hopeful that the police don’t haul me in for acting crazy (“suspect was found clawing at snow bank near church on Boston Post Road”). About the road Baird tells us in his history of the town that “the Country Road ‘Boston Road’ appears to have been laid out in 1672, when Rye was a part of Connecticut...we suppose this to be identical with our present Post Road leading from Mamaroneck River to Byram River, in the same general course as now.”(5) As he was writing in the 1870s, he was cognizant of the changes wrought by the Westchester Turnpike, but not of any changes in the subsequent century, of which there were remarkably few. Baird does relate “the several deviations from the ancient line in the town of Rye,” which is helpful to me, but ultimately unnecessary as the geography of the route as well as the name of the “deviations,” typically ‘Old Post Road,’ point the way pretty clearly. However, it is fair to say in this stretch of the road that a large percentage follows the course of US1 from Rye to New Rochelle, with but a few interesting detours. 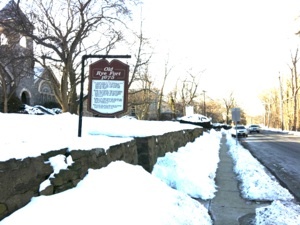 The Old Boston Post Road in Rye: clockwise from top left. 1. 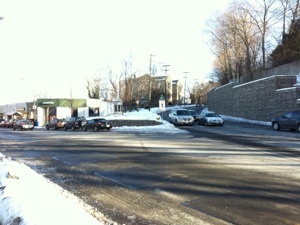 Junction of Purchase Street (left) and Boston Post Road (right). This is the view from the front of Mrs. Haviland’s Inn, now the Square House Museum, and shows the strategic location of the road at the junction of two major roads from the north to New York. 2. Looking southwest down Boston Post Road opposite Mrs. Haviland’s Inn, near the site of the Old Rye Fort. 3. 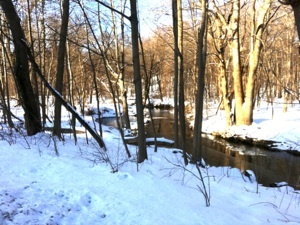 Blind Brook, over which the old road crossed here in Rye. Today this is part of the Rye Nature Center, a bucolic reservation right in the center of Rye. 4. 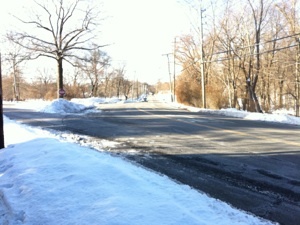 Boston Post Road today crosses Blind Brook a little further south of its original crossing, just beyond the junction of Parson’s Street and Boston Post Road. Note the abundance of snow in all the photographs. Most, but not all, of the sidewalks were cleared by the time I walked through Rye. Even the milestones are out of whack. Well, not exactly. A little further along I reach the Jay Heritage Center, housed in the lovely mansion built by Augustus Jay in 1838. In front of this building I finally track down one of the mysterious Rye milestones, embedded in the wall along the road. Although it is hard to read I can make out that the stone says 24 miles to New York. This makes sense when compared to the other stones in this sequence and to the route of the newer Boston Post Road, which wends its way through the Bronx in a northeast to southwest manner, a markedly different route than the ones shown on older maps, which takes the bridge over Spuyten Duyvil Creek at the very northern tip of Manhattan before crossing the Bronx in an west to east route. A bridge from Harlem to the Bronx was constructed in 1795, which shortened the distance to New York by four miles, and new milestones were placed along the nascent Westchester Turnpike to reflect this change. As these are the familiar red-brown stones I have spoken of in previous entries, I am confident that these stones, which are claimed by more than one source (including, surprisingly, the President of the Jay Heritage Center, where I find this particular stone) to have been placed by Benjamin Franklin in his role as Postmaster General of the colonies (a story I have repeatedly shown to be false), are in fact milestones from the early nineteenth century. The actual distance should be 29 miles as I am only two miles from Mrs. Haviland’s. A brief perusal of Colles’s map shows this to be true as the Jay estate, site of the above mentioned mansion, is located at mile 29 on his map (see above). A simple analysis of my Google map will also show that 24 miles is just too short to be a sufficient distance to cover the old route that George Washington clearly describes in 1789, more than 45 years after Franklin is supposed to have placed the stones. John Jay, the most famous member of the illustrious family on whose property I am standing in Rye, New York, is one of the less well known of the “founding fathers,” but played a pivotal role in negotiating the peace treaties that effected the independence of the American colonies. Among other things, Jay co-wrote the Federalist Papers with James Madison and the more famous Alexander Hamilton (not to be confused with my fellow traveling companion, the good Doctor from Annapolis), was President of the Continental Congress, the first Chief Justice of the Supreme Court, and the second Governor of New York. 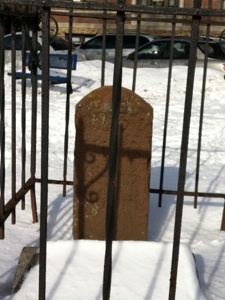 For the last 28 years of his long life, he lived as a farmer in Bedford, New York, but upon his death in 1829, he instructed his heirs to bury him on the property of his boyhood home in Rye, adjacent to the Jay Heritage Center today. Brissot de Warville bestows copious encomiums upon John Jay in his journal as he traveled through the area in which John Jay was born and raised, calling Jay “one of the most distinguished men of the last revolution- a republican remarkable for his firmness and his coolness, a writer eminent for his nervous style, and his close logic, Mr. Jay, at present minister of foreign affairs.” (8) He continues for another page and a half describing specific instances of Mr. Jays’s talents as ambassador to France during the Revolutionary War, before returning to his description of the countryside around the Jay estate. About the Jay mansion he says nothing, but the current house was built on or near the site of the original house shown on the Colles map. Soon after passing the Jay estate, I cross into Mamaroneck Village, which is part of the town of Rye up to the Mamaroneck River, as I mentioned in the previous entry. Mamaroneck is a tough word to pronounce as is obvious from the different ways it is spelled in the various travel diaries that mention the place. President Washington mentions Mamaroneck and spells it the way it is spelled today. Reverend Cutler also spells it correctly, mentioning that the fording place across the Mamaroneck River is four miles from Mrs. Haviland’s. Sarah Knight calls it “Merrinak,” and calls it “ a neet, though little place, with a navigable river before it, one of the pleasantest I ever see.” (9) James Birket calls the town “Marrowneck,” the first place he stopped in New York, where “we breakfasted at a good Clean decent house, and had plenty of Tea Chocolate and Toast And also Sweetmeats, we had not seen such cheer since we left Rhode Island...”(10) Colles’s shows a creek with a mill at mile 28, which I am pretty sure I cross over shortly after reaching Mamaroneck, as I reach a road to Harrison that fits with the topography of the map. 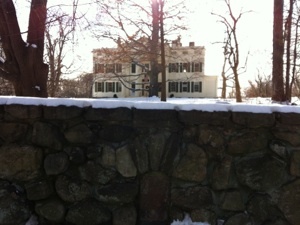 At 734 Post Road I pass a house with a plaque stating that it is Gidney Farm House from 1790. Two “Gidney” houses are shown in this area on Colles’s map, a little before the river, so I am pretty confident I am on the right track. When I reach the center of the village I can tell that Boston Post Road is the wrong way over the river and that a spur road called Tompkins Avenue appears to be the better choice, so I follow Tompkins Avenue to the river. Just at the junction of Boston Post Road and Tompkins Avenue there is a small triangular green upon which sits a milestone! I head over to read it and discover another of the red “Turnpike Milestones.” This one is in great shape and reads 23 miles to New York, which fits with the milestones in Rye, but is clearly a stone from a date later than the time Colles’s produced his map. Tompkins Avenue is a quiet, unprepossessing residential street that slopes gently to the river, which I cross over on a pretty cast iron bridge. The river is surprisingly pretty, and the water flows quite rapidly down to the sea, tumbling over rocks on its way. On Colles’s map the road turns sharply south towards the ocean after crossing the river, before following the coast for nearly a half mile. Today I follow East Prospect Street, which rises steeply up from the river to reach bustling Mamaroneck Avenue, the center of town. I stop for a pastry and a cappuccino at a little Italian bakery called Boiano’s. It is not quite the delicious pastry I had hoped for but it is pretty good and is baked on the premises by locals who are proud of their town and their products. The cappuccino is great, I get into a nice discussion of the merits of Pitbulls, Rottweilers, Dobermans, and German Shepherds with the gentlemen at the table adjacent to me, two older Italian-Americans, one of whom seems to have a connection with the bakery (the owner?). I will resume my walk in the next entry, but for now I will sit and have a second cappuccino, and rejoice that this is not a chain. This is as close to Mrs. Haviland’s as I am likely to get so I might as well enjoy it. Rye and Mamaroneck, New York, Top left is the Augustus Jay mansion, built in 1838, site of Jay Heritage Center, on Boston Post Road. 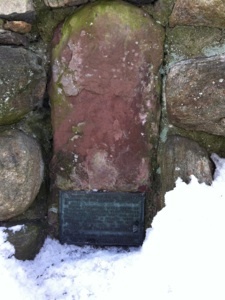 Top right is a Milestone set in the wall of the Jay Estate which reads “24 miles to New York.” Bottom left is the next milestone in the sequence which is in Mamaroneck Village and reads “23 miles to New York.” Both are part of the stones set after the development of the Westchester Turnpike, probably about 1804, thus accounting for the shorter distance to New York. 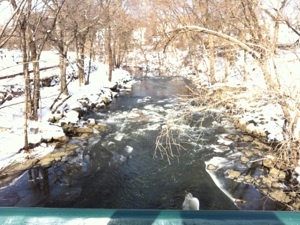 Bottom right is the fording place across the Mamaroneck River, from the bridge at Tompkins Avenue. 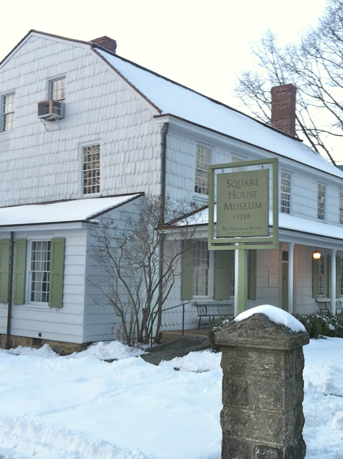 Square House Museum, also known as Madam Haviland’s Inn, visited by George Washington and many others in the late eighteenth century, Rye, New York. George Washington, Diary, Thursday October 15, 1789. J.P. Brissot de Warville, New Travels in the United States of America, 1792. 2.J.P. Brissot de Warville, New Travels in the United States of America, 89. 4.Charles W. Baird, Chronicle of a Border Town: The History of Rye, Westchester County, 1660-1870, Including White Plains and Harrison until 1788 (New York: Anson D.F. Randolph, 1871), 71. 10. James Birket, Some Cursory Remarks, 39.